The following 101, on beekeeping for first-year new-bees, comes from BrooklynHomesteader and HOMEGROWN member Megan. Thanks so much, Megan, and please keep the good ideas buzzing! Honeybees are a wonderfully low maintenance and beneficial addition to any backyard or rooftop garden. Having one or two apiaries nearby can dramatically increase the rate of pollination in the surrounding flora, resulting in more abundant crops and ample seed for propagation. What’s more, you’ll get to harvest your own personal brand of raw honey to be used as a sweetener, to give as gifts, or to sell locally and supplement your income. The steps from beeless to beekeeper are fairly simple but should be followed closely so that you don’t end up with a metaphorical bee in your bonnet somewhere along the line. 1. Do some background reading on honeybees, their behavior, and needs. PBS has a beautiful documentary called The Silence of the Bees that you can watch for free on its website. This is a wonderful and fairly current documentary that touches on the anatomy and functions of honeybees, their role in modern agriculture, and the dangers they face. If watching this doesn’t conjure up the will to become a beekeeper in you, not much will. There are many other tremendously useful resources and blogs floating around that will help you get better acquainted with the way of the honeybee. One of my favorite sites comes from Michael Bush, a beekeeper based in southeastern Nebraska. He has assembled what I believe to be the most helpful and expansive database of beekeeping information on the Internet. He maintains a library of historical bee documents, plans for building your own hives, a glossary, and beekeeping tips—so much useful information. I’ve been to the site dozens of times and still come across something new and fascinating each time I visit. 2. Read some more—especially by the following authors. There are a few really wonderful manuals on beekeeping out there right now. I would recommend The Complete Idiot’s Guide to Beekeeping, by Dean Stiglitz and Laurie Herboldsheimer. A great primer for first- and second-year beekeepers, this manual focuses on natural methods of disease and pest management, whereas many other books offer chemical-treatment solutions. Between this title and Beekeeping for Dummies, by Howland Blackiston, you should have enough information to get you through your first season without breaking a sweat. With a little further investigation, well-respected beekeepers like Ed & Dee Lusby, Sam Comfort, and Kirk Anderson will show up on your radar and open you up to new opportunities for better understanding your bees. 3. Join a beekeeping club in your neighborhood. Over the past ten years, hobby beekeeping has seen a huge surge in growth and, as a result, beekeeping clubs and meet-ups have popped up in most cities and counties across the country. Use Bee Culture's state-by-state listings to find the closest club to you. Once you find one, start attending meetings regularly. Talk to beekeepers, make friends. These are the people who will come to your aid when you’ve got a problem and are unsure how to proceed. In my opinion, a beekeeper’s best defense against disaster is a more experienced beekeeper’s number on speed dial. If there isn’t a club in your area, the next best thing is the Beesource Forums. Beekeepers of various experience levels from all over the world frequent this message board and give some of the best advice around. Post a question then come back in an hour or two to a dozen thoughtful responses. Great stuff! 4. Take a class. Almost every beekeeping club out there offers a short course on the subject. If you want to learn the ins and outs of beginning beekeeping, classes are the best way to go. You get the benefit of asking your instructor direct questions, and you can also buddy up with another new-bee if the commitment of keeping bees by yourself is more than you're ready for. I recommend classes for anyone who's not quite ready to dive in based on research alone. 5. Order your gear and your bees. Depending on what sort of hive you plan on using (Warre? Top bar? Langstroth?) you may want to build your own hive. Making a Warre or top-bar hive is fairly simple, if you have basic woodworking tools. If you want to use a Langstroth hive for honey production, you will most likely want to buy and assemble the premade materials, as the parts are precision cut—and there are lots of them. There are a few well-known and reputable online beekeeping suppliers from whom you can purchase everything you need, bees included. Brushy Mountain Bee Farm, Dadant, and Better Bee carry all of the materials and tools for hive building. They even have kits that make everything less stressful. You can buy packaged bees for pickup through Brushy Mountain and Better Bee, or you can order them through your local beekeeping club. Another method of buying bees is by purchasing a Nucleus hive or “nuc.” A nuc is a five-frame version of a Langstroth hive. It contains built comb with brood (eggs, larvae, pupae) and usually will also come with a queen that has been laying eggs for a couple of weeks. The benefits to purchasing a nuc are that you get a bit of a headstart in the brood-rearing process and you don’t run into the issue of insufficient queens as often, since they’ve been given time to prove they mate well. Replacing a failed queen can mean a lapse in brood production, which, if allowed to continue too long, can result in a smaller work force during the nectar flow. Fewer workers = less food coming in = higher chance of starvation over the winter. So, the benefits of starting with a nuc can be pretty substantial. Once you're a little more experienced, you can also catch swarms to start your new hives. While swarm-catching isn't recommended for novices, beekeeping clubs like the Backwards Beekeepers in Los Angeles generally eschew buying bees, instead focusing on rescuing swarms. The benefits? One: Swarms are free. Two: You're likely rescuing the bees from being exterminated. And three: Swarms build up faster than packaged bees. One other thing to note: New colonies should be fed either sugar syrup or frames of stored honey from a healthy colony to carry them through to the nectar flow. Purchase a hive top feeder so that you can supplement the bees easily. My favorite feeder is this inverted jar type that results in zero bee drownings. And don’t forget your tools! Novices should have a smoker, a hat and veil, a hive tool, and a bee brush on hand when working with honeybees. 6. Decide where to put your hive. This eHow article does a pretty straightforward job of articulating what to consider when choosing a hive location. If you are considering a rooftop location for your bees, make sure that it's safely accessible and will be easy for you to carry equipment and wooded wear up and down. Especially with urban bees, you also want to make sure to give them a clean, accessible water source. I love galvanized chicken waterers like these, because evaporation is slow, and few bees drown in them. 7. Keep your eye on the queen. During the first couple of months after you acquire your bees, you want to perform routine inspections to ensure the queen is laying plenty of eggs. (She can lay up to 2,000 a day!) 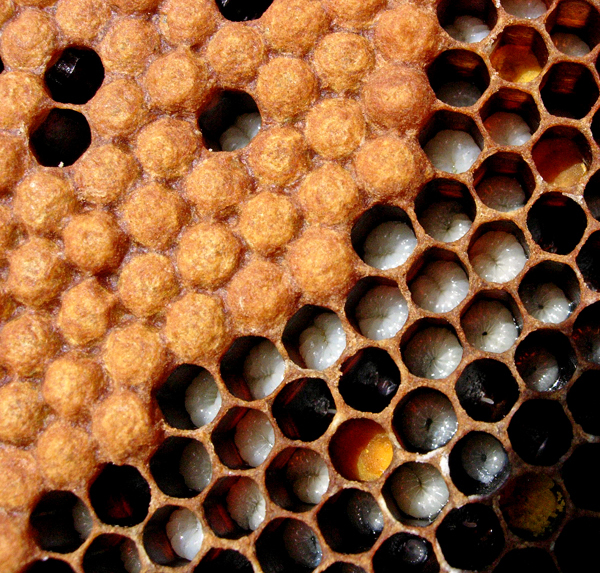 Look for eggs, larvae, and capped brood in a tight, centralized pattern on the frame. There should be one egg per cell. If you can’t find any eggs or larvae at all, you could be dealing with queenlessness and should order a mated queen ASAP. You can purchase queens from breeders like Jennifer Berry over the phone. Re-queening requires that you find and remove the old queen or definitively establish there is no queen present. To do so, thoroughly inspect each frame then place it in an empty super next to the hive until you’ve searched the entire colony. Once this is done and you've secured a new queen, wait one day before putting her (in her candy-capped cage) into the hive. This will help ensure that the workers accept her as their new mother. If you're resistant to buying a queen and you have more than one hive, take a frame or two of new eggs and larvae from a strong colony. Make sure the queen isn’t on the frames and then, gently but firmly, shake all of the bees off the frame and into the hive. Place this beeless brood frame in your queenless hive’s brood chamber and close it back up. The worker bees in the queenless hive will adopt the new brood. They'll raise a new queen by building emergency queen cells onto some of the worker cells, and they’ll begin feeding those throne contenders royal jelly to speed up their development. The problem with this solution is that it takes time, and the longer a colony is queenless, the fewer worker bees are out foraging for nectar and pollen for the winter. In the first year, this buildup is crucial. For this reason, I suggest purchasing a queen for first-year colonies, if needed. 8. Give them their space. As the bees begin to build out each frame with comb, you must be ready to give them more space to grow into. If you are using a Langstroth, make sure you add a new super when seven or eight of the ten frames have been built out with comb. This ensures that the queen will have all the space she needs to lay eggs, and the house bees will have plenty of busy work to do. Idle hands do the devil's work. (Yep, this saying applies to bees, too.) Once the brood chamber has expanded to the appropriate size, you can start adding honey supers, which you will be able to harvest in the late summer, or you can grab frames of capped honey sporadically through the season. 9. Show me the honey! Once you’ve got fully filled and capped frames of honey above the brood nest, you can start harvesting them. Many beekeepers wait until July or August, when the entire honey super is full, before removing the whole thing entirely and extracting their liquid gold using a centrifuge. But for a backyard beekeeper, it's perfectly acceptable to harvest by the frame, replacing frames taken from the hive with empty ones for the bees to build out. You can cut the comb out of the harvested frames and crush it with a mortar and pestle before straining and bottling your final product. A tip: Honey has antibacterial and antifungal properties, so it never spoils—no special precautions or refrigeration required. If crystallization occurs, simply submerge the sealed jar of honey in a pot of hot (not boiling) water, and the crystals will dissolve. 10. Prep for winter. Bees don’t hibernate in the winter. Instead, they cluster tightly inside the hive and use their wing muscles to generate friction, keeping the hive warm. They migrate over frames of stored pollen and nectar, eating as they go. They will not break cluster or leave the hive until the temperature outside exceeds the mid-40s, with sun and minimal wind. It's important to keep the hive fully stocked in order for the bees to make it through the winter. When you remove the honey supers at the end of the summer, inspect the brood chamber. You should have about 80 to 100 pounds in the hive body for the bees to eat through the winter. If they don't have that much ready, supplement their stores with frames of honey from the honey supers, from stronger colonies with ample stores, or begin feeding them sugar syrup in early fall. Securing the hive against weather and pests is also crucial this time of year. To do so, weigh down the outer cover of each hive with a heavy rock or cinder block. This should keep strong gusts of wind from blowing the cover off and exposing the bees to the elements (i.e., certain death). In colder climates, some beekeepers will wrap their hives in black roofing paper or insulation to help keep the internal chamber temperature constant. For rooftop bees or bees in milder climates, this is not necessary. You also want to keep freeloading rodents out of the hive. To do so, attach a mouse guard or hardware cloth to the hive entrance. Bees can come and go, but mice can’t get in to build nests, destroy comb, and disrupt the cluster during the winter. Finally, some beekeepers recommend treating bees in the fall for Varroa and tracheal mites. Personally, I don't treat my bees and instead rely on integrated pest management (download a PDF here) to help keep my bees healthy. 11. Play the waiting game—and be prepared for emergency feedings. Once your hives are winterized, it’s all about waiting. The bees are on their own until February, when, on a mild day, you'll check in on them to make sure they're not running out of food. Ideally, the bees will have had enough honey and pollen to ensure their survival. Sometimes, though, this isn't the case, and you'll have to feed them to help them make it to first bloom. Once your nectar flow starts, your bees will quickly begin to build up their workforce, gathering all of the available pollen and nectar, and transforming those ingredients into the magical substance beekeepers prize so dearly. • Got a pesky bee question buzzing in your brain? Or just want to bee around more like-minded folks? You might considering the HOMEGROWN Apiarists group. • You probably don't have a shortage of things to do with honey, but we love these homemade honey sticks and the classic bee's knees cocktail. • Don't miss Charlyn's Beeswax Candles 101 and Clare's 101 on setting up a solar beeswax melter. • If you're looking to expand your backyard-livestock horizons, you might give the Raising Rabbits 101 and Backyard Chickens 101 a gander. Want more advice from Megan? Or want to share your own tips? Post a comment below and keep the conversation rolling! You can also snag a recording of Megan's Urban Beekeeping 101, a three-session workshop from 2012 available for a donation of whatever feel the information is worth. And you can always find more things to plant, grow, cook, preserve, make, craft, and tend in the HOMEGROWN 101 library. This is great. So many people getting into beekeeping. We shot a Beekeeping 101 video in Massachusetts with a Chef friend of ours, Mary Reilly. She's really great. Hope you enjoy it! Thanks for mentioning the Backwards Beekeepers! How do you deal with ants? We've got terrible ants here. You can keep your hive on a stand and create a moat of water or oil around each leg of the stand. Think coffee cans of vegetable oil under each leg. Ants won't be able to access the entrance! What a good read! My husband and I are taking classes right now, should be getting our supplies in the mail any day now! Yay!